Before his keynote address at “Speaker Blowout: Ferguson, Racism and the Media,” Dr. Cornel West sat down with a student media representative. Student Media: To start off, I wanted to ask you about your experience. As an academic and lifelong activist, what would you say to students who feel torn between pursuing an education or dropping out and mobilizing? Especially since students of color particularly struggle with this. 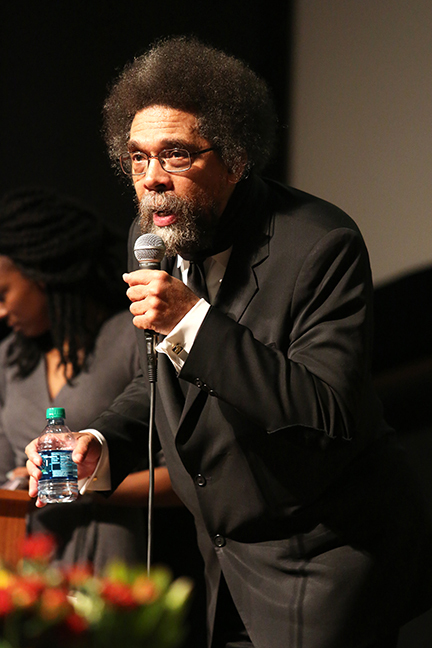 Cornel West: I think it’s very important that you seize educational opportunity — so much sacrifice has gone into it. But in seizing educational opportunity, I think trying to be a force for good outside of the university, or inside the university in a political way, is on the same spectrum of seizing educational opportunity. Part of your education is learning to be a sensitive and courageous person. So you want to be able to pursue the life of the mind but you still want to be a whole human being. And sensitivity and courage is integral to being a whole human being. What would you say to us as student media makers? How can we be more conscious of the content we are creating? You know, like being culturally sensitive and being conscious of the impact our content has. CW: Well I mean there you don’t want to in any way imitate the mainstream media because there’s not a lot of integrity in that process or courage in their reporting. They’re tied to the bottom line, money making and their careers. So you say to yourself, “Well I want to be a media maker in the student context, how can I keep track of the truth?” The truth has its own complexity but sometimes it has its simplicity too. Sometimes, it’s not as complicated as people think. But, to embark on pursuing that truth means that you’re not necessarily going to be popular. Mainstream press has got to be popular to stay in business but truth questers may not necessarily be popular. They cut against the grain. How can students find that courage to embark on a quest for truth? CW: Only by example. It’s just like, if you want to learn how to ski you can’t just read the book on skiing, you have to put the skis on and get out there and start skiing. The same in terms of truth seeking and courage. When you see others doing it, it becomes highly inspirational and that’s a beautiful thing. Who was inspirational in your life, that pushed you to be a seeker of truth? CW: Well, I was blessed to have my brother Clifton who went to UC Berkeley actually. He was very courageous. Early on I had members of my church, Shiloh Baptist Church in Sacramento. Those were very courageous people. And then we had people on the national scene — Angela Davis, Huey Newton, Martin Luther King and Malcolm X, Fanny Lou … very important figures. Curtis Mayfield and Sly Stone were speaking some deep truths. Nina Simone was speaking some very deep truths, very inspirational. What did that mean for you as a young person, to see all of those figures in your life? CW: It meant that you had company. It’s nice to have some company. You don’t want to be, at least you don’t want to feel like you’re so isolated out there by yourself. That’s the last thing you want to do. Sometimes it takes a small network, a few friends or comrades. Sometimes that’s all you have. That’s very true. Switching gears a little bit, I also wanted to ask, you’ve been involved in academia, in film and in music. What role do you think art plays in social justice? CW: I think art is fundamental. It’s central. It’s not on the edges at all because art is really about imagining a different world to get outside of the conventional contours of the status quo. The great artists are those with great imagination and usually, tremendous empathy. So you can’t have any serious talk about social movements, social activism unless you use your imagination and empathy. Very much so. Why do you think that there seems to be this distinction placed, putting the arts to the side all the time when, as you’re saying, it goes hand in hand? CW: The history of education, especially for elites has always been fearful of the arts because it might tell the truth about the status quo they benefit from that needs to be called into question. Now, ironically of course, many of the elites themselves go on to speak some of those truths and be critical of the very institutions from which they come. But artists have always been pushed to the margins of most educational systems, most curriculums, especially musicians. They’ve got to create their own subcultures and do it on their own. Yeah, and create those same systems of support. Speaking of breaking that status quo, why do you think Ferguson has become this sort of tipping point for our nation? CW: I think it was probably just the scope and the depth and the breadth of the disrespect and contempt for the body sitting there four and a half hours, refusing two ambulances and finally when the SUV comes they take the body, throw it like it’s a piece of meat. That really hit the folks in a very visceral way, that level of contempt and disrespect. Because I mean, it happens all the time in cities all around the country, but there was something about the treatment of our precious brother, Michael Brown, that hit people and they’ve been out in the streets. In your perception, has the government’s reaction exacerbated that? CW: Yes, absolutely. Inaction, relative inaction. At the federal level, right now they’re still supposedly going through the investigation, we’ll see but don’t hold your breath. But at the local level of course, the contempt was reinforced by the sheriff and at the state level, by the government. So it made it even worse — more contempt, more disrespect, more contempt, more disrespect. What do you think that we as young people, in Ferguson but across the country, can learn from this? CW: I think we can learn from the unbelievable courage and vision of the young people there. Ashley Yate’s and Tory Russel’s and Tef Poe’s and others. They have been really quite heroic and really trying to create a social movement right on the spot over against the traditional black leadership that’s been an impediment — getting in the way. Could you elaborate a little bit on that for me? CW: Well, Al Sharpton and the others are tied to the federal government. They basically are extensions of what the federal government wants, what the president wants. And we know the Obama administration facilitated and even promoted the militarization of the police. The bills went through the last few years and that’s true for Congress, but for the White House too. So traditional black leadership comes in as extensions of federal government. They are actually part and parcel of the war that has been declared on the young people. And so they try to play it both ways but you reach a point where you have to answer the questions — which side are you on? The young folk see very clearly which side most of them are on. It’s a pivotal moment. To see that power for young people? How was it for you when you went to Ferguson, to witness that? CW: It was majestic for me to see young folk on fire. It’s a beautiful thing. A very beautiful thing, beautiful to anybody. But for young people and young black people in Ferguson, it’s a magnificent thing to behold. I was just glad to be there and stand alongside them. What are your thoughts on Governor Nixon’s activation of the National Guard in anticipation of the grand jury’s announcement? CW: We wonder whether it’s legal, whether he actually had law authorizing to do it. But it’s certainly provocative in terms of making a situation much more fraught with tension, no doubt. No doubt indeed. So we shall see in the next couple days. Are you worried about the reaction from the people on the ground? CW: I think there will be an explosion. Not just in Ferguson, in cities around the country. So we’ve got to be prepared for the explosion.